So what is a mandala? The word Mandala is a Sanskrit word that means “circle”. 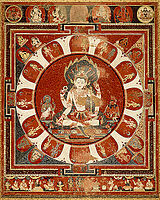 Mandalas have been seen in Buddhist and Hindu religious art forms dating back for centuries. 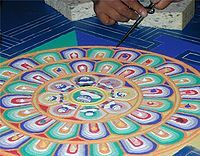 Mandalas have been used in various spiritual traditions, to focus the attention of aspirants and adepts, as a spiritual teaching tool, for establishing a sacred space and as an aid to meditation and trance induction. 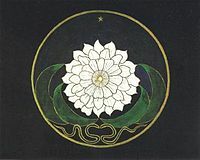 According to the psychologist David Fontana, the symbolic nature of a mandala can help one “to access progressively deeper levels of the unconscious, ultimately assisting the meditator to experience a mystical sense of oneness with the ultimate unity from which the cosmos in all its manifold forms a rises.” The psychoanalyst Carl Jung saw the mandala as “a representation of the unconscious self” and believed his paintings of mandalas enabled him to identify emotional disorders and work towards wholeness in personality. http://en.wikipedia.org/wiki/Mandala In my art therapy training I learned all about developmental drawing and learned that it is the circle that children will often draw first. It may not be perfect, but you can definitely see it. People also often circular imagery when they doodle. See if you are doing this unintentionally or try this technique if yo u are having a stressful day. Im the last person to push techniques on others, but I have found this to be helpful for myself. For me drawing circular imagery or colouring a mandala can be very relaxing and probably the closest I can come to meditating. I’m one of those people who has a mind that never shuts up, so this technique really helps me, especially if I’m stressed or tense. I always knew that I was going to have a business of my own, whether it was a private practice or an art centre and that I was going to call it Mandala. For my company logo, I bought a program called Mandala Maker and it is a fantastic computer program that actually helps you to draw and create mandalas. http://www.abgoodwin.com/mandalamaker/ If you like to make Mandalas I would absolutely recommend this program to you. Just a warning that it can be highly addictive! 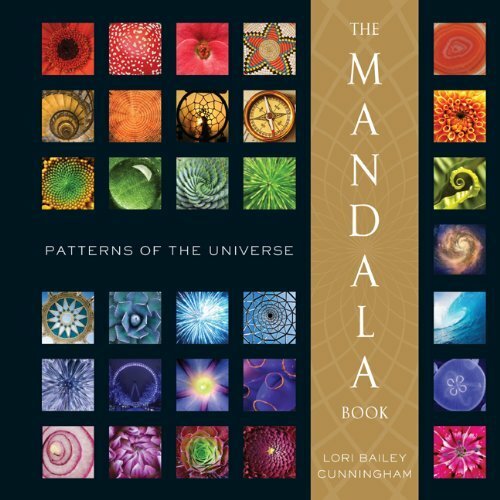 The other day I was at Chapters (another one of my favourite places) and I saw a book called the “The Mandala Book: Patterns of the Universe”. It was graphic representations of Mandalas in everyday life. Circular imagery and form is something that happens constantly in nature. This book had some amazing pictures of very simple, yet complex Mandalas in nature and in civilization. When you start to look for them, you will see Mandalas are everywhere.